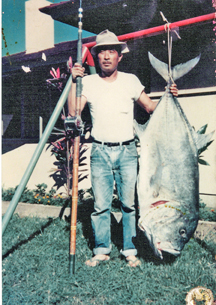 Toshiaki Uradomo won the Kula Fishing Club's Largest Ulua Award in 1966 for this 105-lb ulua. He caught the fish in West Maui while using a half/half (half bamboo, half fiberglass) pole and a 4/0 Penn Senator reel. Toshiaki's wife, Florence, was one of his fishing companions and she was frequently called upon to gaff fish in the churning shoreline surge. The Kula Fishing Club ceased to exist years ago and this catch was made known to Hawaii Fishing News by Jiro Fay in 2005--nearly 40 years later!